Introducing the Innolift -A New 'Self Loader' Stacking solution. 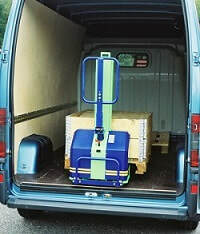 The Innolift is an ingenious patented product that is the answer to those van and pickup unloading and loading headaches. This new self loading stacker offers a useful alternative to stackers, pallet trucks, tail lifts, ramps and swinglifts. 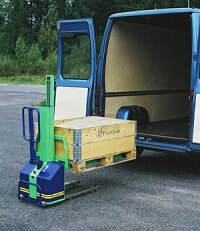 The Innolift van pallet stacker helps operators load and unload vans handling Europallets, stillages and other loads and manoeuvring them within the body. The Innolift van pallet stacker is a revolutionary new lightweight durable forklift that is designed to be transported with the goods, in light to medium commercial vehicles. This van pallet stacker is the only lift loader to lift itself into and out of a delivery van, leaving the driver to operate completely independently from the warehouse staff, and eliminates the health and safety hazards of manual loading and unloading. ​​The Innolift van pallet stacker is extremely cost-effective, allowing a quick return on a small investment which has leasing arrangements available, maximising the tax saving on the purchase (subject to status). Manufactured to very high standard, reliable and simple to operate and maintain, the machine can lift up to 600 kg as high as 1.12 metres. Powered by a 12V battery, a 8kw motor and hydraulic pack, the Innolift van stacker comes with a high speed charger and a charging lead for in-vehicle charging. There are 4 models available with the largest machine weighing just 204 Kg, eliminating the need for an expensive tail lift which requires a separate pallet truck. Designed for use with open bottom pallets, skids and crates, the versatile Innolift stacker is ideal for moving heavy medical and office equipment, white goods, building materials, UPS equipment and anything on a Euro Pallet. Stanley and Aga cooker suppliers. Heating and electrical equipment suppliers and installers. Delivery companies and couriers who can actually charge their customers for using the Innolift, which shows a direct return on their investment. This means that the Innolift is a must for any business regardless of size. Can lift up to 600 kg as high as 1.12 metres. Can be loaded and unloaded in seconds. 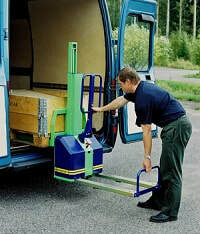 Using the innolift eliminates lifting health and safety issues. The ease of use helps to reduce costs and improves working conditions. Ideal for any small or medium commercial vehicle. Suitable for any warehousing environment. No operator’s licence is required.